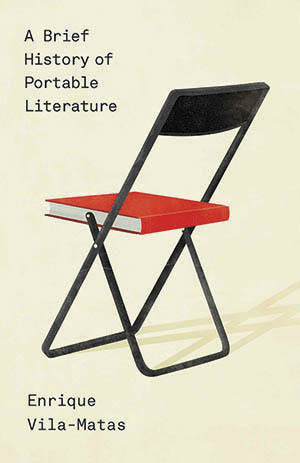 In only 84 pages, Vila-Matas has crafted a dizzyingly original work… Brief History Of Portable Literature is a work by a deeply serious writer, dressing up his paean to the writer-reader relationship in the trappings of an experimental and lighthearted little book. An author (a version of Vila-Matas himself) presents a short “history” of a secret society, the Shandies, who are obsessed with the concept of “portable literature.” The society is entirely imagined, but in this rollicking, intellectually playful book, its members include writers and artists like Marcel Duchamp, Aleister Crowley, Witold Gombrowicz, Federico García Lorca, Man Ray, and Georgia O’Keefe. The Shandies meet secretly in apartments, hotels, and cafes all over Europe to discuss what great literature really is: brief, not too serious, penetrating the depths of the mysterious. We witness the Shandies having adventures in stationary submarines, underground caverns, African backwaters, and the cultural capitals of Europe. For Vila-Matas, literature is a chamber of echoes. But rather than thinking of this as a criticism, this is to be embraced—one of literature’s eternal beauties. His intelligent playfulness and his fervor for written language are visible on every page and highlighted by this excellent translation. Vila-Matas is a master, one of the most gifted contemporary Spanish novelists. Vila-Matas’s touch is light and whimsical, while his allusions encompass a rogue’s gallery of world literature. Arguably Spain’s most significant contemporary literary figure. Vila-Matas’s work made a tremendous impression on me. I was so fascinated by his humor, the incredible knowledge he has of all kinds of literature, his compassion for writers, and his fearlessness in taking on literary subjects and making that part of what he is writing about.